Jim Mallinder stressed his delight after Saints once again kept the Ospreys at bay to earn a gritty success in south-west Wales. For the second time in as many meetings in this season’s Champions Cup, Mallinder’s men refused to let the PRO12 leaders cross the whitewash. It was a strong defensive showing from the Aviva Premiership table-toppers, who had thrashed Ospreys 34-6 in the reverse fixture in October. Tries from Calum Clark and George North, allied with 10 points from Stephen Myler, ensured George Pisi’s first-half sin-binning did not prove crucial. And Mallinder was full of praise for his side, who now face a winner-takes-all clash with Racing Metro at the Gardens next Saturday. “I’m pleased with the game because it’s about control and we had good control,” said the Saints boss. “We didn’t overplay because when Ospreys defend the way they do they’re dangerous. They look to come up in the outside channels and cut you off. Sometimes that can be dangerous and it can work for or against you. “We didn’t want to take chances, we thought our pack could get on top, they did and it was a good scrum performance. 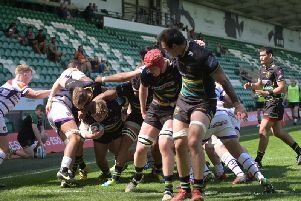 Saints had slumped to a 20-7 defeat at Sale on the previous weekend, but they showed huge character to recover. And Mallinder said: “It was a good reaction to last week. The players coming back boosted us in all the right areas. “Our lineout was better and Christian Day was very good. Defensively, we were a lot better than last week, too.